15% Off All Our Raised Beds – This Weekend Only! Yes that’s right, but only until Midnight of Monday 31st May so don’t miss out on this very special offer. We’re offering you the opportunity to save 15% off any of the wonderful products from our FSC Wooden Raised Bed range and in addition to that, we’re giving you 10% off all our other products for the same period too. So now that the weather’s getting better and it’s the perfect time to get out in the garden and ‘Grow Your Own’ we want to make it as easy and cost effective as possible for you to do so. Simply quote the following codes at checkout and your discount will be automatically applied to your order: to save 15% off Raised Beds quote ‘RBED15’ and to save 10% off all other orders, quote ‘TENPERCENT’. Have a wonderful bank holiday weekend and don’t forget……..
New Products For The Allottment! Wheelbarrows available in all colours! Before you dash out into the garden or the allotment this week do not forget the Slug Gone and the Watering Can. We have some great wheelbarrows and I can never understand how anyone manages without two wheelbarrows! If you are not exactly dashing out into the garden do try the Mushroom Kits. They are very rewarding and completely mouth wateringly delicious, and, as they kids say, no problem! Propagators are still extremely popular, and not just for incubating eggs! Many of you have found the Propagators a great help for germinating seeds and protecting seedlings. For the very patient among you I am pleased to say that the long awaited Rotary Soil Sieves will be in within a week and will go out to those of you who have been patiently waiting without touching the sides. Buying a new TV set? Save cash and energy by choosing a set with an integrated receiver for freeview. Because integrated digital TVs don’t need a separate gadget to pick up digital channels you could save pounds in reduced electricity bills – and up to 20kg of carbon emissions per year. Thanks FoE ! Until I read this I thought I was saving money! Saving comes in different guises. Buying a new radio, then? Digital (DAB) sets marked as Energy Saving Recommended use 75per cent less electricity than a standard model. If 7 million radio buyers chose an Energy Saving Recommended model it would save enough electricity to light every street in the country for a month. Here at The Recycle Works, we try wherever possible to promote recycling in all areas of life and the ‘Love Food Hate Waste’ campaign are working hard to help us all waste less food. Did you know that each year we throw away 8.3 million tonnes of food? That’s about £50 per family, per month. Incredible! So here for you, courtesy of www.lovefoodhatewaste.com are some tips to help us all waste a lot less! Leftovers – being creative with them is a clever way to save money and make what’s in the fridge go further. Know your dates – Food can be eaten right up to a ‘use by’ date or frozen. ‘Best before’ dates are for quality so there is no need to throw out food on the stated date – eggs being the exception. It pays to plan – Make a list before going shopping. Plan your weekly meals and you could save a fortune! We are still enjoying a steady supply of mushrooms from our Mushroom Growing Kit, and as promised this week we have one of our favourite yummy mushroom recipes for you. My children love this recipe, which is always a good sign, and it’s ready in around 20 minutes! 1. Melt the butter in a pan, add the onions and cook until soft. 2. Add the mushrooms, cover and cook for 10 minutes, stirring occasionally. 3. Meanwhile bring a large pan of salted water to the boil, add the pasta and cook for 2 minutes. 4. To the pan of mushrooms and onions, add the lemon juice and garlic, cover and cook for a further 5 minutes, stirring occasionally. Add the parsley, salt and pepper and mix well. Add around 5 tablespoons of cream and heat through. 5. Drain the pasta well and toss in the sauce. Add more cream if necessary. Sprinkle grated parmesan cheese on the top and serve. For a healthier option try substituting some of the cream for crème fraiche. This dish is nice with a side dish of crispy salad leaves. Enjoy! We’re really excited about the new Patio Glasshouse made by Hartley Botanic – the best commercial glasshouse manufacturer! The Hartley Patio Glasshouse is specifically designed to fit neatly onto your patio area, balcony, rooftop garden or school garden. The ultimate for urban growers with limited space or as a junior addition to your grown-up greenhouse where Gardening Children can enjoy their own plants. 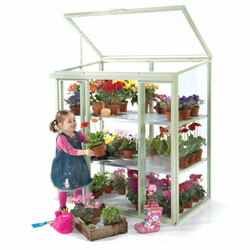 This compact robust and well engineered little greenhouse is manufactured from BS1474 aluminium with BS6206 toughened safety glass. A wonderful new product and available for a very limited time with an introductory price – order before midnight on Sunday 9th May and receive 10% off your order when you quote ‘HARTLEY’ at the checkout.